If you’ve read this blog then you already know I can’t go anywhere without getting in the water and scuba diving. Without knowing anything about it I’d figured Hawaii would have a reputation for very enjoyable scuba. But the more research I did about Oahu the more concerned I became – numerous complaints about dive operations taking non-certified divers, little bottom time, and overcrowded boats/dive sites are all recipes for a not-so-great time. I guess it was to be expected at one of the most touristy destinations in the world. 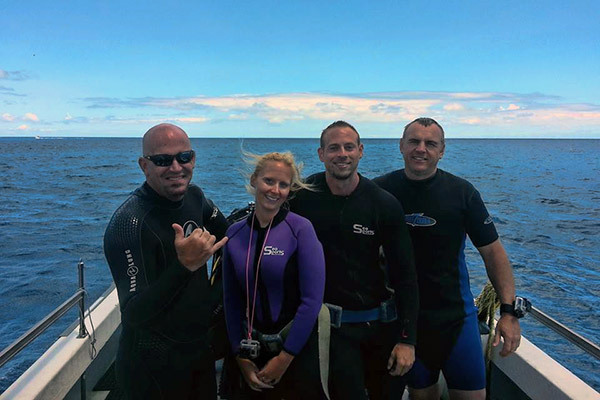 Thankfully with a little effort you can find reputable dive operators that will do their best to give you a memorable and pleasant diving experience. After digging around I found just the kind of company I’d been looking for.. Reef Pirates Diving. Why did I decide to book with them over other operations? They take a maximum of 6 divers at a time; keeping the boat uncrowded & their attention on me. They own their boat which is not always common in Oahu. FREE pickup shuttle to and from my hotel directly to the boat. No transportation needed. After 2 days and 4 dives later I couldn’t be more happy with the choice I made. The owner and staff were all very friendly and as advertised it was a small group. All of our dive sites had nobody else around and the dive guides were great at pointing out marine life. I’ve been diving and snorkeling to many great locations around the Caribbean which were amazing – how would Oahu compare? The water was warm and the visibility was great. The reef I saw in Oahu was nothing too special though, especially when compared to that of a place like Cozumel. Large sea turtles and eels were in abundance as were a lot fish I’d never seen before. Considering I only had a total of 4 dives it’s safe to say there was a lot more to be witnessed than I had time for. Being in the water and observing marine life firsthand is what I love most about scuba, so I really enjoyed the diving quite a bit. 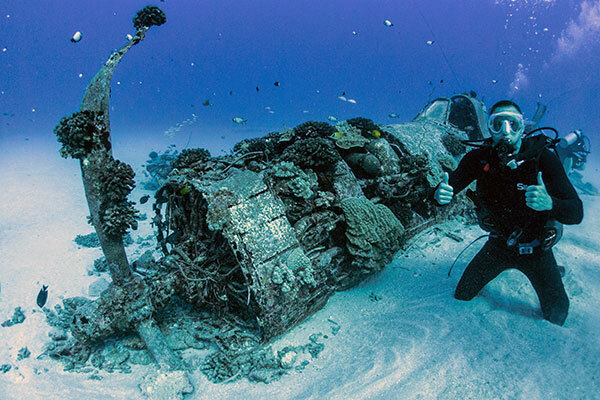 Oahu also has some neat wreck diving available, but with just 2 days to spare I was only able to dive one – a World War II Corsair plane wreck from 1946 at 105 feet depth. What a unique and cool experience that was! There’s a local guy who routinely dives with the Reef Pirates and shoots underwater photos; posting the best of the pictures up on the Pirates’ Facebook page. He was out with us on all our dives. 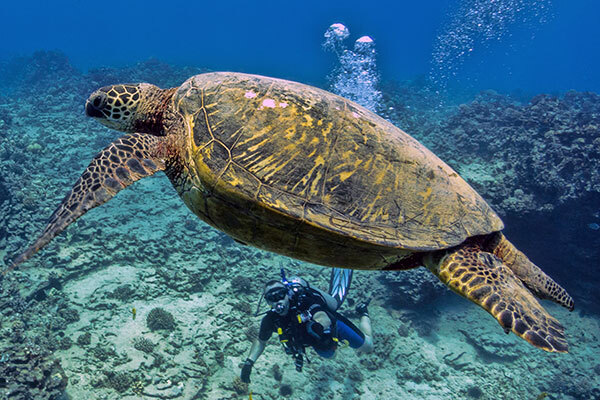 Want an idea of the marine life you might see diving here? Check out his awesome Instagram account. Diving with Sean (Reef Pirates owner) on left. 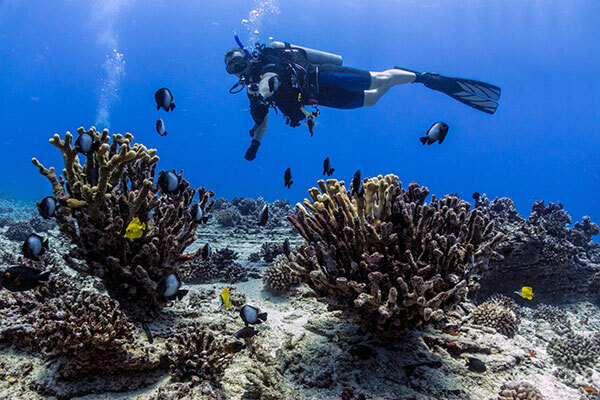 If you’re in Oahu and like to dive don’t let the negative reviews about it scare you away. Find a good operator and enjoy the beautiful water.. I know I did!